Don’t you know who I am? I’m Chick-a-dee-dee! Of course, the chick-a-dee sounds like a vocal nametag to us only because someone had the good sense to name chickadees after their call. But it serves as an identifier among the chickadees too. The “chick-a-dee call complex” consists of four note types (the A, B, C, and D notes in a row might be transcribed as chick-k-ka-dee) that can be given in various combinations. Each note type itself can vary in frequency and duration. The chickadees thus have a lot of potential variation to work with, and they do. The D (dee) notes alone indicate both the identity of the individual bird calling, and the flock it belongs too—rather the same way that an Englishman saying “Hello, my name is George,” might indicate to compatriots both his own identity (George) and, in his accent, the region he is affiliated with. When captive chickadees are put into new flocks, the calls of the new flock members change, converging on each other, to indicate their new flock membership. The chick-a-dee call is used in many contexts. When chickadees come across a perched predator, chick-a-dee is a mob alarm call, summoning other chickadees to come harass the potential predator in order to drive it away. The number of dee notes in that alarm call tells other chickadees how large that predator is, and by extension, how dangerous it is: dee-dee-dee-dee is a Northern Pygmy-owl, small, maneuverable, and dangerous; dee-dee is a Great Grey Owl, large and not very dangerous. And all that is just from those dee notes! The other three note types almost certainly carry meaning too; we just haven’t figured it out yet. Researchers have found that the order of the four note types is not random, and that the “sentences” that are chick-a-dee calls have similarities to human sentences, including grammar rules and a length limitation imposed by the need to take a breath. Chickadees say other things, too. Seet is the alarm call for a predator in flight, much more dangerous than a perched predator. A faint fee-bee means “Where are you, my mate?” A chickadee startled at its nest cavity by its mate will twitter; one startled at the nest by a predator will hiss. Fighting chickadees snarl. Female chickadees give variable sees to solicit copulation from their mates, who, while copulating, give variable sees themselves. Young chickadees sing a “subsong,” which seems not to be true communication but practice, like a human baby’s nonsensical babbling. Like Dark-eyed Juncos and House Wrens, Black-capped Chickadees are common backyard birds, unlikely to make the cover of National Geographic. Lots of research has already been done on all of these species. But it’s exactly because we already know so much about them that we can get at increasingly deep, exciting questions by studying them. I doubt anyone could have predicted beforehand just how much information can be gleaned from a few dees. Hailman JP, Ficken MS, Ficken RW. 1987. Constraints on the structure of combinatorial “chick-a-dee” calls. Ethology 75:62-80. Smith SM. 1991. 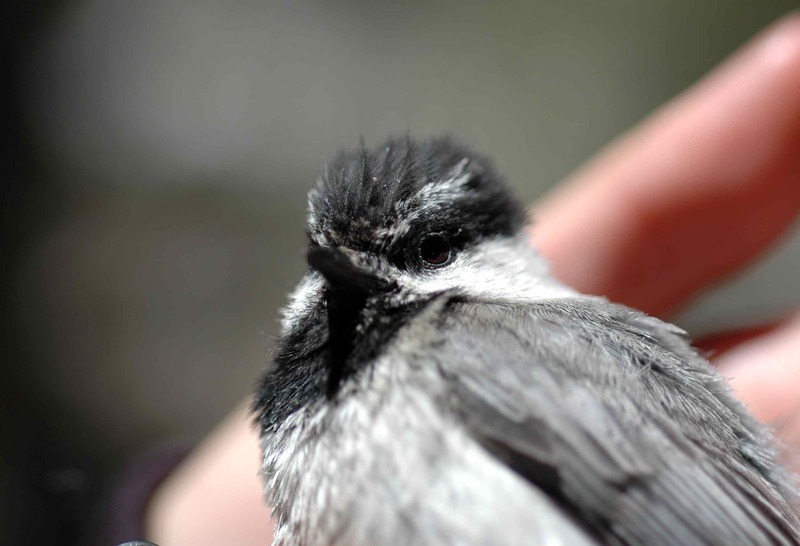 The Black-capped Chickadee: Behavioral Ecology and Natural History. Ithaca, NY: Cornell University Press. Templeton CN, Greene E, Davis K. 2005. 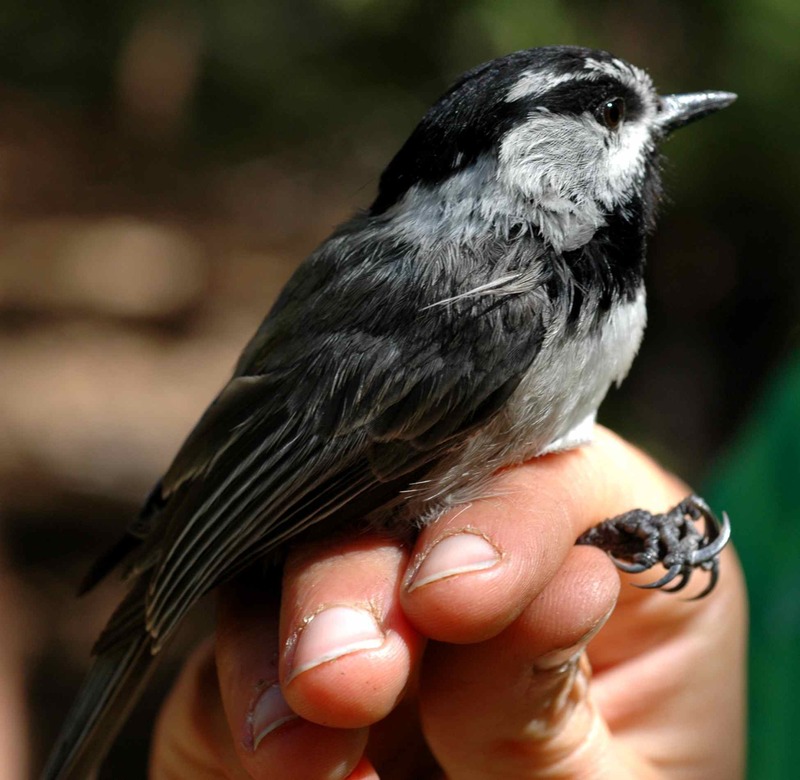 Allometry of alarm calls: Black-capped Chickadees encode information about predator size. Science 308:1934-1937. This entry was posted in general science-y stuff, miscellaneous, other people's research and tagged birds, Black-capped Chickadee, communication, science, song by toughlittlebirds. Bookmark the permalink. We have loads of these lovely, friendly birds in our backyard. I just ordered another book by Susan M. Smith (1997.Wild Bird Guide: Black-capped chickadee). We’re preparing feeders for a Minnesota winter and want to know as much as we can, so this was a very timely post! Awesome! They’re great winter feeder birds. I’m always impressed to see them out in the middle of snowstorms, tiny impervious fluffballs.